Peter Malone reviews Alice Neel, Uptown, curated by Hilton Als, at David Zwirner Gallery, New York, on view through April 22, 2017. 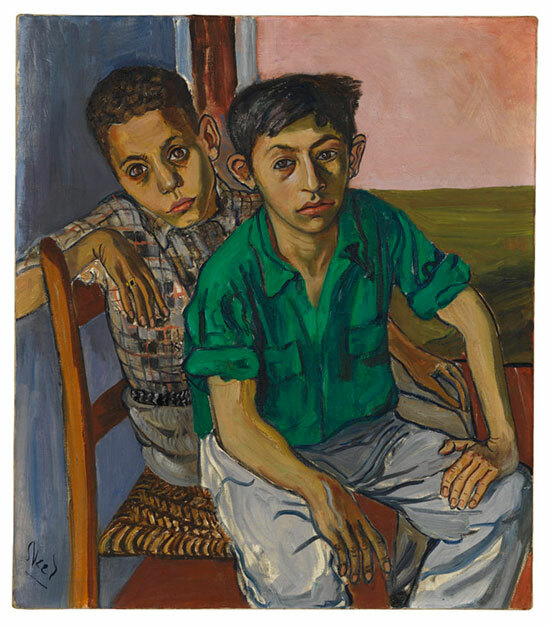 Malone writes: "One of the gems in the show is a canvas titled, Two Puerto Rican Boys, 1956. It depicts a pair of kids looking up at the painter while sharing a chair in a way that compelled the youth in the back to lean over his companion’s shoulder. Neel captured the gaze of each boy with conviction. The comparison a viewer is likely to make between the two—their faces are practically in parallel to one another—tends to multiply the wonderful individuality of each."